A dagger or peshkabs with a two edged watered crucible steel blade thickened point and broad back ending half way along the top edge with a cut cartouche. The centre of the blade has a curved channel to reveal loose pearls that move along the passage when the dagger is tilted. The blade is further embellished with arabesques and floral motifs overlaid with three different alloys of gold to subtly vary the colour. The cartouche overlaid with a Persian inscription reading 'Work of Ibrahim, 1877'. 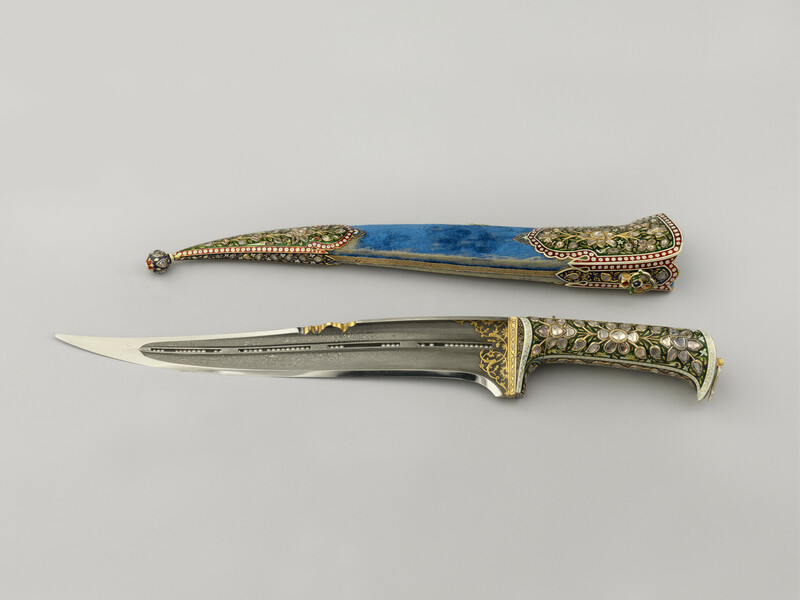 The dagger hilt and scabbard mounts are made of gold, enamelled with flowers and birds in white, blue, green and red enamel. The enamelling probably undertaken by craftsman based in Alwar, Rajasthan. The hilt has a hinged finial that can be unscrewed to reveal the rod that fits through the length of the hilt and holds the loose pearls in place. This dagger is remarkable for its ingenious blade and craftsmanship and is technically admirable in the fact that the bore follows the curve of the blade.